Enjoy the unobstructed views of Lake Ontario from Water’s Edge at the Cove. 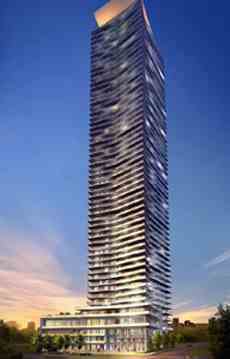 The proposed 56 storey residential condo is located in the Mimico neighbourhood in the city of Etobicoke. Stunning full-sized kitchens and extravagant master bedrooms bring both luxury and comfort. 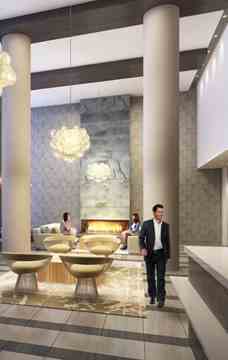 - Easy access to the Gardiner Expressway and QE. - Steps to the walking and cycling trails, lake and beaches. - Short driving distance to downtown Toronto. - Close to restaurant, shops, parks, schools and hospital. - Indoor pool with sauna, whirlpool and Cool Plunge Pool. - Elegant party room with private dining room and outdoor terrace. Water’s Edge at The Cove Condos is the new condo development from The Conservatory Group, located at 2163 Lake Shore Blvd, Etobicoke. It is in the city of Etobicoke. The Gardiner Expressway is at the north side and connects you easily to downtown Toronto. This waterfront location has the best access to walking and cycling Humber Bay Park trail. Architect : E.I. Richmond Architects Inc.